"One thief. Two kids. Three witches. No mercy." Signature Entertainment has debuted an official trailer for an indie horror titled The Night Sitter, from filmmakers Abiel Bruhn & John Rocco (A Not So Pleasant Surprise). This premiered at a few genre festivals last year and is getting a release this summer. It's hard to figure out what's going on in the trailer, but it certainly does look freaky and unsettling. Inspired by masters of horror cinema like Argento, Raimi, and Carpenter, The Night Sitter is a "nostalgic, creepy-as-hell horror described as Home Alone meets The Evil Dead." This stars Elyse Dufour, Jack Champion, Jermaine Rivers, Amber Neukum, J. Benedict Larmore, Ben Barlow, and Joe Walz. Watch out for witches. When a scheming con artist (Elyse DuFour) poses as an innocent babysitter called Amber, in a bid to steal from a wealthy occult enthusiast, a trio of witches are accidentally summoned by the man’s reclusive son, Kevin, as his sitter sets about stealing his father’s valuables. As the playful, sadistic witches start picking people off, Amber and Kevin form an unlikely bond and try to survive the night together. 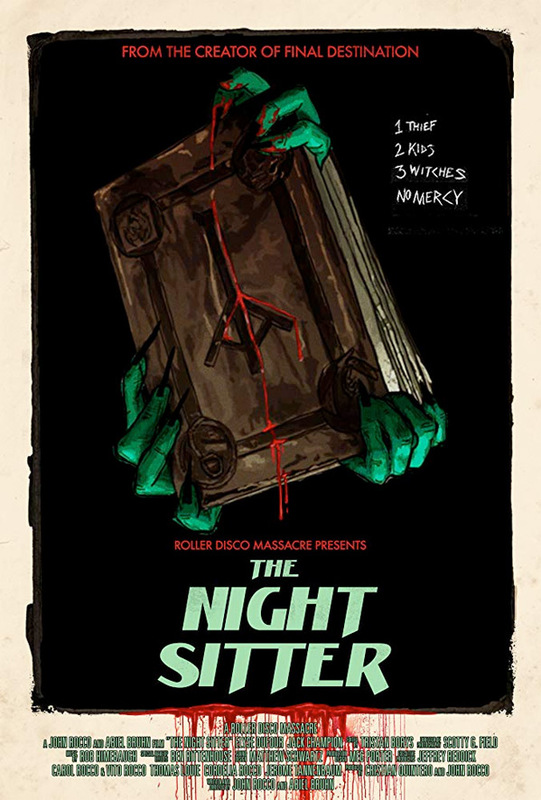 The Night Sitter is co-written and co-directed by filmmakers Abiel Bruhn & John Rocco, their second feature film after A Not So Pleasant Surprise previously, and a number of short films. This premiered at a few small genre film festivals last fall. Signature will release The Night Sitter in the UK starting June 17th this summer. Scared?